Find a funcontainer or lunch box to make your Ice Cream Cone Kit! Fill small containers with your toppings. Secure small magnets to the backs of each small round container and attach containers inside of the top lid. Add other toppings such as hot fudge in case your recipientlikes an ice cream sundae alternative. Adding pretty napkins and a colorful paper bag filled with ice cream cones adds another splash of color. Embellish with cute labels and voila your Ice Cream Cone Kitis ready to gift! 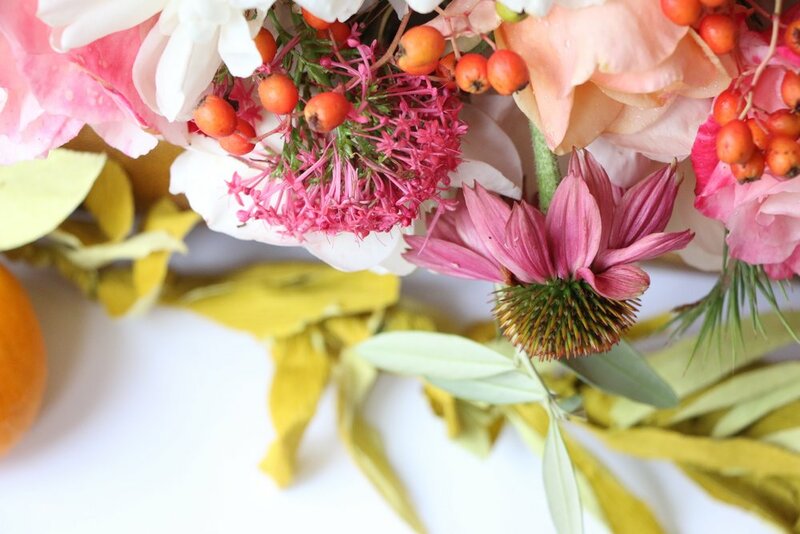 One of my favorite ways to celebrate the fall season is with a beautiful floral arrangement! Check out the DIY instructions below! Flowers, oranges etc for your fall arrangement! 1. Take a sheet of Oasis Floral Foam and cut to fit the inside of your plastic container or baking pan. Fill the container with water and the Oasis soak for one hour. 2. Place the container with Oasis in the bottom of your suitcase. 3. Now it is time to start making your beautiful fall arrangement. Stick flower stems into the Oasis, one by one until your arrangement is full and overflowing. Looking for a lovely new way to display your photos? Try creating this photo wreath frame. By using dried and faux flowers, I was able to frame my memories in a beautiful and ethereal way. Perfect for a holiday gift or memento to hang year long! If you do not have a pre-made wire wreath create your own! Take your wire and mold into a circle that will be big enough to house your photo. Double the wire and make an additional circular wreath. Attach the two wire circles together by tightly wrapping a two inch piece of wire on each side of the wreath. Using clear fishing wire, tie two pieces of the clear wire from the top of the wire wreath to the bottom. Hot glue your photo directly on the clear fishing line. Now arrange your flowers and moss. Once you like the layout hot glue your flowers and moss into place! I like a slightly asymmetrical look but you should what pleases your eye and looks well with your photo.